The murchison falls lies at the end of the albertine rift valley, where the sweeping Bunyoro escarpment tumbles into vast, palm-dotted savanna.it’s uganda’s largest and oldest conservation area,hosting 76 species of mammals and 451 species of birds. Murchison falls national park is bisected by the Victoria Nile, which plunges 44m over the remnant Rift valley wall, creating the dramatic Murchison Falls, the centerpiece of the park and the final event in an 80km stretch of rapids. The mighty cascade drains the last of the rivers energy, transforming it into a broad, placid stream that flows quietly across the rift valley floor into lake Albert. This stretch of river provides one of Uganda’s most remarkable wildlife spectacles.Regular visitors to the river banks include: Elephants,Giraffes and Buffaloes while Hippos , Nile crocodiles and Aquatic birds are permanent residents.Murchison falls National Park notable visitors include Winston Churchill, Theodore Roosevelt, Ernest Hemingway and several British royals. 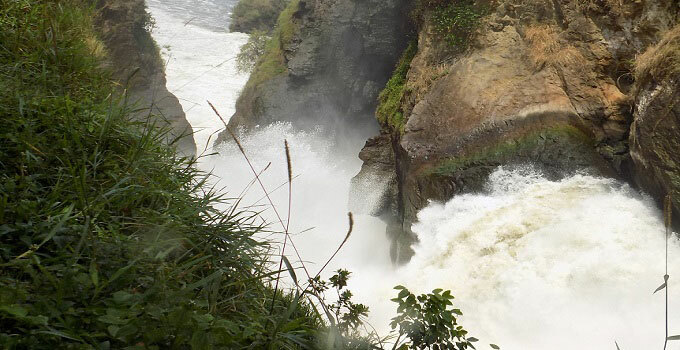 While at the park, areas of interest include: Murchison falls that is characterized by eternal war between rock and water.The waters violently compress through a narrow gorge, spraying misty droplets along their wake over 50 m radius that creates a permanent Rainbow over the battle field and causes a continuous roar. River Nile, Nile delta, Buligi game tracks, Paraa, Karuma Falls, Kaniyo pabidi forest and Rabongo forest.